It's easy to take a cat's cute little paws for granted, however they're vulnerable to a variety of conditions. Ranging from simple infections to immune-related disorders, potential cat paw diseases include pillow foot, pemphigus and eosinophilic granuloma. An eosinophil is a type of white blood cell. When a cat has a parasitic infection, her eosinophils are one of her body's defense mechanisms to battle the infection. Occasionally, her body mistakes benign material, such as dust, for more serious things, such as fleas. When that happens, she'll experience an overreaction to the innocent trigger that leads to damage of her collagen. Known as eosinophilic granuloma complex, the reaction can present around the cat's mouth or throat, chin or abdomen, hind legs or footpads. When the cat's footpad is affected, she'll develop lumps on the bottom of her paw that often become ulcerated as she walks on them. The condition is often self-limiting. However, if it doesn't clear up, medication such as cortisone may be prescribed and the vet may recommend other options such as vigorous flea control, testing for food allergies and other medications. Pododermatitis is a mouthful, so you can break it down to its roots and call it foot inflammation, or pillow foot. Pillow foot occurs when a cat's lymphocytes produce antibodies in response to inflammation or infection. Symptoms of the condition include a soft, puffy appearance of the paw pad that can take a purple hue or become ulcerated. Usually more than one foot is affected. The antibiotic doxycycline is often used to treat plasma cell pododermatitis. Steroids such as prednisone may be used if doxycycline is ineffective. At present, this poorly understood condition is managed but not cured, usually putting a cat into remission. Occasionally surgical removal of large masses on the paw pads is required. Sores and/or bleeding ulcers on the toes. Limping or reluctance to move. Nodule or papule on the toe. Tumors or sores elsewhere on the body. 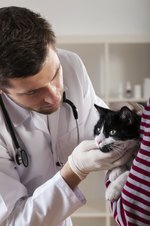 Treating squamous cell carcinoma depends on how many tumors the cat has and where they're located. A single tumor on one toe is usually surgically removed, often through toe amputation. Generally, a cat can expect a full recovery from such surgery, with his movement limited while he recuperates. If there are multiple tumors present, pain medication will provide your cat relief. A veterinary oncologist may be necessary to determine if there are other potential treatments. Fluid-filled cysts in the skin. Swollen lymph nodes and generalized swelling. In severe cases, a cat will need supportive care, provided at the veterinarian's office. Steroids may be used temporarily to provide relief until the condition goes into remission. Monthly or quarterly vet visits during remission help the vet monitor the cat's progress. A cat's paw is vulnerable to infection, either from fungus or bacteria. When a cat's claw develops a bacterial infection, it's often a result of an underlying condition, such as allergies or autoimmune disorders. The vet will determine if there's a root cause to be treated, as well as prescribe antibiotics. Loose or fractured nails will be removed and occasionally, a foot scrub or soak helps. In the rare case of a fungal infection, an anti-fungal is prescribed, often in conjunction with foot soaks and frequent nail trimming to remove infected growth. Blood or pus at the wound site. The vet may use a general anesthesia to relax the cat while her wound is cleaned. Antibiotics such as penicillin typically are prescribed and pain medication also may be necessary.